As the end of the year approaches I start to think about all the cool adventures I was lucky to be apart of. I also start planning awesome adventures for next year. The calendar is already starting to fill up and I am pretty excited. Sometimes I get my ideas from friends and family often times I get my ideas for adventure from the books I have read. Here is a list of books that have inspired me to live a life of adventure. This book is about a tragic climbing season on Mt. Everest in 1996 leaving 5 people dead and several others scrambling for their lives. 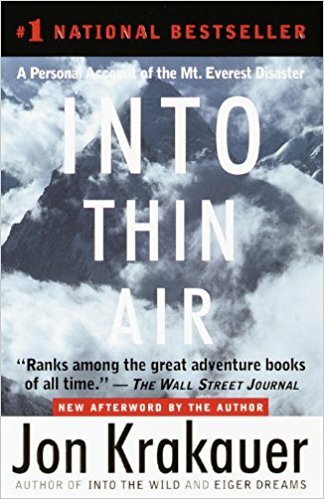 Yes this book is about life and death on the world's biggest mountain but when I first read this book I was living in Omaha NE desperate for some adventure in my life. After reading this book I bought a bus ticket from Omaha NE to Estes Park CO to climb Longs Peak. Longs Peak is one of Colorado's highest mountains at 14,259 ft. sitting in Rocky Mountain National Park. After picking up a new pair of hiking boots and a used back pack and tent from a local thrift store, I was off to the Rocky Mountains to climb my first mountain. Going from barely 200 feet above sea level to spending the night below the milky way at 12,500 feet in less than 24 hours, I was definitely feeling the effects of high altitude sickness. After a night of very little sleep my blistered feet and I were standing on the summit of my first mountain ever. My first real solo adventure. This book set in Thailand is about a young backpacker who is given a hand-drawn map with directions to a beautiful island with a hidden lagoon and beach, located in the gulf of Thailand and inaccessible to tourists. 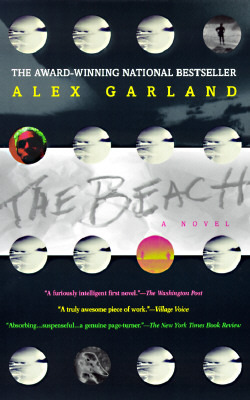 A few months after reading this book I worked the summer as a host, busser, bar-back and server at a small restaurant and lodge in the Grand Teton National Park. I saved every penny I could and bought a plane ticket to Bangkok. Living for two months out of a back pack on less than $1,000 dollars, this was my first international trip and easily the best adventure of my life. The story of the author's four month journey by train from his home in London through Europe, the Middle East, India, South East Asia, and back home through Siberia. This book taught me how to enjoy not just the places I visit, but also the adventures sometimes involved with getting from point A to B. Whether that is a 36 hours bus ride in SE Asia or hitching a ride on a cargo boat down the amazon river. After selling his home, the author loads his dog and surfboards in his truck and embarks on a quest through Mexico to Costa Rica to find his long lost friend and surfing companion. After reading this intimate memoir of catching waves, making new friends and evading bandits; you will have a hard time fighting the urge to sell all of your possessions and get lost in Central America. This is exactly what I did. I got rid of everything I couldn't carry in a small pack and bought a ticket to Central America. I spent months questing my way through the jungles and beaches of Central America leading to a chance encounter with Captain Zero himself on a beach in south east Costa Rica. I will save that story for another time. This is an epic story of a convicted bank robber who escapes a prison in Australia and flees to India, where he lives for 10 years. Beggars, Gangsters, prostitutes and holy men, burning slums, 5-star hotels, romantic love and criminal philosophers and a mafia godfather. This book was about more than just one man's unreal time in India — this book was about the human experience. I wanted it more than anything. I wanted an adventure that would pulse through my veins and wrap around my heart. Which is why after reading this book I spent a year backpacking through Europe and Asia. I definitely never wanted to be chained to a wall and tortured. Only to see the world and have an adventure of a lifetime. Deep water soloing, living on junk boats with strangers, hiking in tiger filled national parks at night, helping people fix highway bridges in third world countries or hitch hiking train rides through the jungles are all apart of the adventure. A moment in time that will last forever.